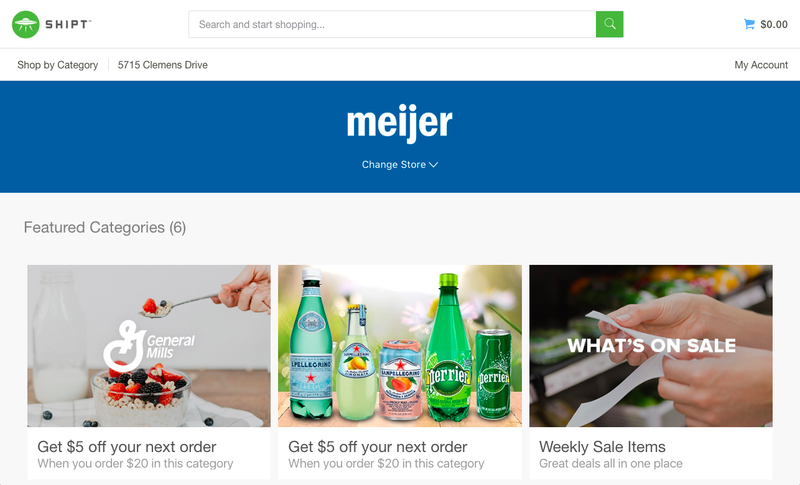 Review of Grocery Delivery with Shipt & Meijer | The Food Hussy! This post is sponsored by Shipt but all opinions are my own. Let me set up a typical Saturday for you. Hubby goes to work and I have a list of things to do. I have to get the oil changed, get the car washed, stop and pick up cat food, drop things off at Goodwill, write a blog post, grocery shop, do the dishes, do a couple loads of laundry and keep my sanity! With this huge list - sometimes things don't get done - right? Groceries can wait until Sunday - right? But guess what - hubby still needs milk for breakfast tomorrow. Well have I got the solution for you!!! I recently did a Facebook live when Shipt delivered my groceries and you can get a peek in my house and what I buy every week! I ordered them at 10am and at 4pm - ding dong - at my door! Obviously not having to go shopping was great! I got everything done on my list - while Bianca was doing the shopping. I got home - even got to take a quick nap - and then there she was - bringing my groceries right in my kitchen! The ordering process was super simple too! You head to Shipt.com and put your zip code in to find your local store then - you can see what's on sale, shop by category or search for specific items to put in your cart. With one click you can see everything in your cart too. One of the most exciting things to me is that Meijer is the only place that carries Certified Angus Beef! They are my favorite meat - it's a much higher quality - so I only get steak and roasts that are CAB. Now - I can have it brought right to my door! ORDERING TIP: When you add deli meat or cheese - it adds them in half pound increments. So click twice if you want a pound. ORDERING TIP: With fruit/produce - it puts most items in one at a time - so if you want three bananas, click three times. You can also leave notes about how you like items (i.e. green bananas). 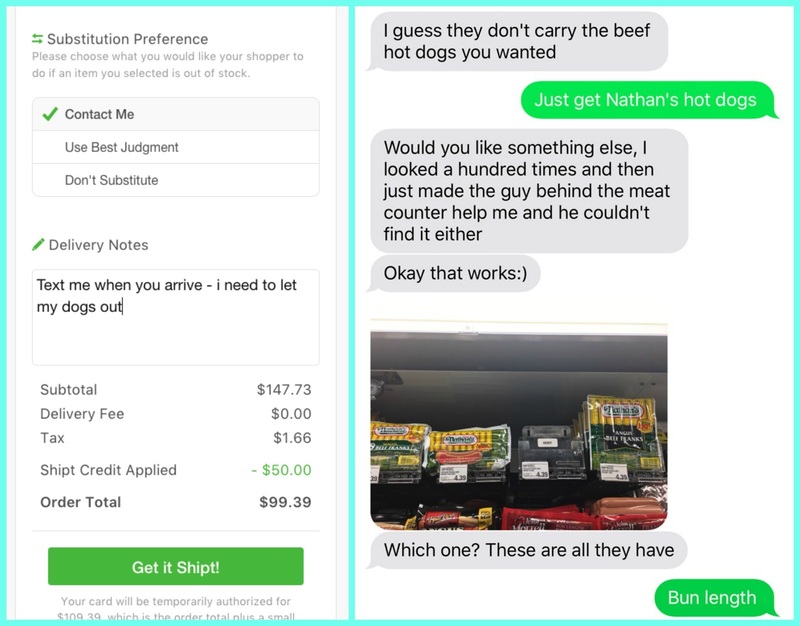 Shipt has a really great substitution policy too - you choose if they need to contact you, use their best judgement or not make substitutions. Bianca was great - she texted me when she was at the store and when she had a question about an item she couldn't find. You can see our text exchange above. 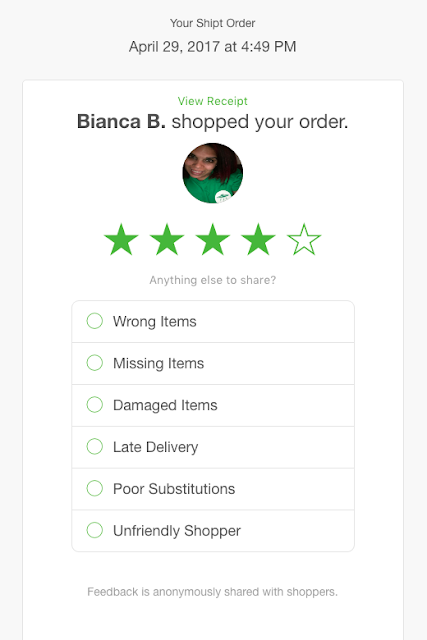 You can also rate and tip your shoppers after the trip. 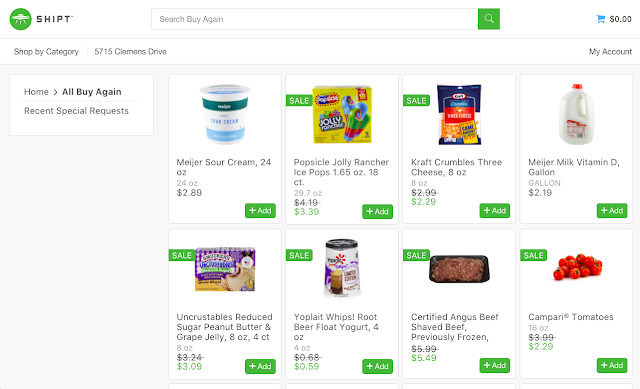 Shipt has every product you can think of too - but I was still able to discover new products. I found that there's a new whipped yogurt in a root beer float flavor that I got for my husband. He loves root beer floats so I threw a cup of that in the cart too. The first time you do the shopping it takes a little longer because you have to get your "regular items" in the cart. But you save a lot of time on subsequent trips because you can go to your previous trip and add the items again. It saves a lot of time for the staples like milk, bread, cheese, etc that you get every week. 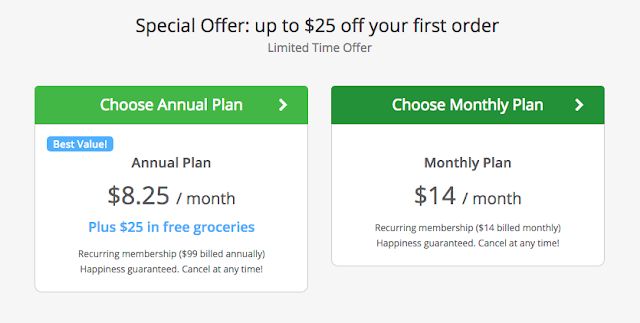 I am giddy about Shipt & Meijer coming to Cincinnati! (This post is sponsored but I was going to sign up before they even reached out to me!) You can find out everything you need to know on their site. Again - you go to Shipt to do your ordering and then they go to Meijer and take care of it all for you! We have this service in Indianapolis. First, it is convenient, and we tried it for a year. In the end, though, I decided to not renew. Weekly grocery bills were from 50 to 80 dollars more expensive than if I went to Meijer myself. I can save more money ordering from Kroger or WalMart and doing a pickup. Granted, it’s not to my door, but I’m saving 200+ per month.